President Obama’s second term is officially underway. The President took the oath of office this morning in a private ceremony in the Blue Room of the White House. Only the Obama family, friends, and some media were present as Chief Justice of the Supreme Court John Roberts administered the oath. Although a much grander public ceremony isn’t until tomorrow, the Constitution requires the President to be sworn in on January 20th. Since that day is a Sunday, the public swearing-in ceremony and Inaugural Parade will be held tomorrow, keeping with historical precedent. This means the Inauguration will coincide with the federal holiday honoring Dr. Martin Luther King Jr. Day on Monday. 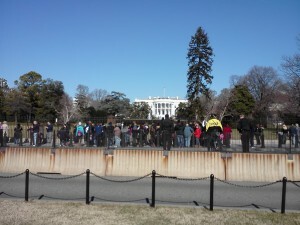 A small crowd and a few journalists including those from WEBN Boston gathered in front of the White House before noon at about the same time the President was taking the oath in the Blue Room. Earlier that day, the President and Vice President Joe Biden had been at Arlington National Cemetery where they participated in a traditional wreath-laying ceremony at the Tomb of the Unknown Soldier. Secret Service agents closed off the area around the tomb while the leaders were there, but visitors and the WEBN Boston crew could see the President’s motorcade drive by in the distance and faintly hear taps being played a short while later. Just before the wreath laying, Vice President Biden was sworn in at the Naval Observatory by Supreme Court Justice Sonya Sotomayor. That ceremony was also private with family, friends, and some reporters to cover the event. Both swearing-in ceremonies were televised live. Both the President and the Vice President will take their oaths again tomorrow. This time it will be during the public Inauguration on the National Mall just before noon.